I do not remember when or where I came across this photograph but I can see why I found it appealing. I am pretty sure the large instrument hanging on the wall is a guitarrón so I assume this photograph was taken in Mexico. 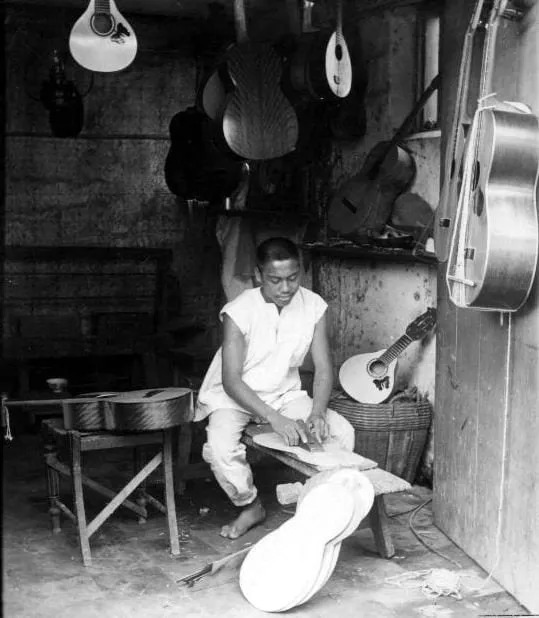 The photograph looks somewhat old but there are still luthiers working in similar shops today. The bench seems perfect for planing tops, backs and sides. Though not clear in the photograph I think there is a wooden bench-stop in place. This is assuming the plane is being pushed, which I think is what is going on because of the way the plane is held. If it is being pulled then perhaps the bench-stop is actually a hold-down or clamp. This approach also makes sense as it is a common practice to plane the thin wood used in stringed instruments away from the end that is clamped to avoid buckling. This may be staged photograph; there are three soundboards leaning against the bench and one being planed but I don’t see a lot of shavings on the floor! He who commits injustice is ever made more wretched than he who suffers it.